St. Raymond of Penyafort was born in Barcelona, Spain, in 1175 A.D, and died in 1275 at age 99. A relative of the King of Aragon, St. Raymond taught law at the Universities of Barcelona and Bologna until deciding to become a Dominican monk at the age of 47. His reason for leaving his highly respected position within academia was because he felt increasingly uncomfortable with his self-pride at his accomplishments. Upon entering the Dominican order, he respectfully requested a position and responsibilities that would help him tame his pride. 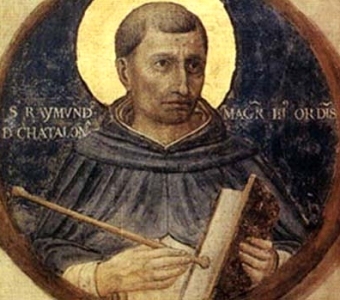 Upon discovering Raymond's intelligence and knowledge of law, the Dominicans gave Raymond the responsibility of collecting and organizing all of the Church's laws relating to sins of men and women. At the order of Pope Gregory IX, St. Raymond later produced a collection of canon law. The "Summa casuum", which treats the correct and fruitful administration of the sacrament of penance, is his best known work. St. Raymond is the Patron Saint of canonists and lawyers. Also known as Raymond of Pe�afort.